Barcelona have triumphed over Real Madrid in the Spanish Supercopa courtesy of a thrilling 3-2 win at Camp Nou this evening, to secure a 5-4 aggregate victory over their bitter rivals. In a match that mirrored Sunday’s first-leg in terms of drama and goalmouth incident, Andres Iniesta and Lionel Messi had overcome Cristiano Ronaldo’s goal to have the Catalans leading at the interval. Karim Benzema equalised in the closing stages, but Messi added a second, his side’s third, to secure yet another trophy for the Pep Guardiola era. Marcelo’s late red left a bitter taste in the mouth, however, as players clashed in the dying moments. Guardiola opted for the same starting line-up that defeated Manchester United in the Champions League final in May, with new signings Alexis Sanchez and most notably Cesc Fabregas on the bench. For Madrid, their one change from Sunday evening was Fabio Coentrao’s inclusion at left-back, with Marcelo omitted. The match at the Santiago Bernabeu, which finished 2-2, had been a thrilling affair and this encounter commenced in a similar vein, with Ronaldo warming the gloves of Victor Valdes in the opening seconds. However, it was Barcelona who found the advantage on 14 minutes, thanks to a sumptuous goal from Andres Iniesta. Messi delayed his through pass perfectly and Iniesta timed his run, before nonchalantly scooping the ball over Iker Casillas and into the net. But their lead was short-lived, as Madrid equalised just six minutes later. From a deep corner, Karim Benzema’s bouncing volley was deflected into the net from close range by Cristiano Ronaldo, who sent a hopeful glance in the direction of the assistant referee before celebrating. Both sides then exchanged chances, as midnight approached in the Catalan city. Pedro produced a superb curling shot that Casillas did wonderfully well to palm to safety and then Ronaldo’s piledriver was pushed onto the crossbar from Valdes, the effort proving too hot for the shot-stopper to handle. 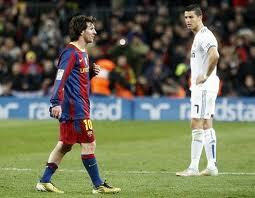 But Messi, just as he had did on Sunday, struck on the stroke of half-time to send his side in 2-1 up. Latching onto a backheel from Gerard Pique, he held off Ronaldo and flicked his shot into Casillas’ far corner. After the break, the match lost some of its rhythm and the aggression was ramped up, particularly as the visitors attempted to claw their way back into the contest. Pepe scythed Messi down, then appeared to catch Pique with a late elbow, as the animosity between the sides simmered under the surface. Messi and Sergio Busquets both came close to extending Barca’s lead, but as they looked close to seeing out the game, Madrid were able to draw level. On 80 minutes, a corner from the left prompted a scramble inside the six-yard box; Pepe rose highest, powered a ball across the area, and Benzema controlled, swivelled, and slotted out of the reach of Valdes. Extra-time beckoned. In a bizarre moment, Madrid celebrated the equaliser, but Barca fans embraced the first appearance of Fabregas, who was introduced into the fray. But Barcelona were not to be denied. With just three minutes remaining and both sides fighting for a winning goal, the indefatigable Messi collected the ball, played out wide and continued his run to meet Adriano’s cross with a sublime volley into the corner to spark rapturous scenes in the stadium. After such an exciting tie, however, the fixture exploded in injury time. Marcelo wrapped his legs around Fabregas in a wild lunge and was shown a straight red from the referee. All 22 players descended on the incident and the officials fought to regain control amidst a flurry of confusion, before David Villa and Mesut Ozil were also issued reds in the middle of a mass of players. Once the dust settled, Barcelona could finally collect their title deep into the night, to conclude what was a quite astonishing Clasico encounter.